It took a while for us to start liking Pasta but now we are so fond of it that at least once every week,one dinner is pasta.But we are quite particular how our pasta should taste-loaded with veggies in a cunning white cheese sauce,okay I do cut back on the cheese most of the time and thin down the sauce with the water in which pasta was cooked,but yeah you get the drift,don't you? 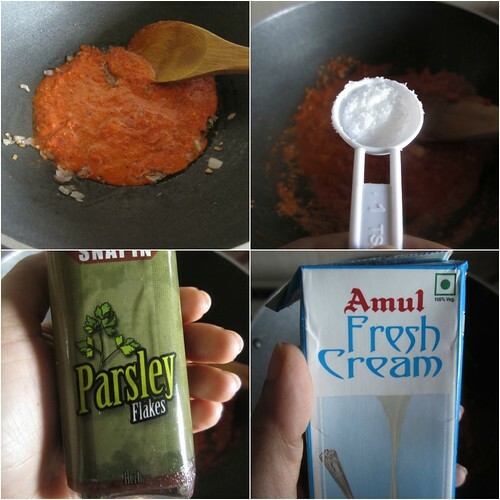 Long back,I had made marinara sauce from scratch and added pasta to it but we didn't like the flavor much,not as much as we did the white sauce.So I was wary to try this one out but the roasted pepper sauce with cream sounded too good not to try.I tried it with whole-wheat pasta from Fabindia but regular pasta should work fine too. Roast the bell pepper on a high flame for about 5-7 minutes,or until the pepper is burnt/charred on the outside.Set aside on a plate until cool to the touch. Peel off the charred skin and cut open the pepper,remove the tip and the inside membranes.Chop the pepper roughly. 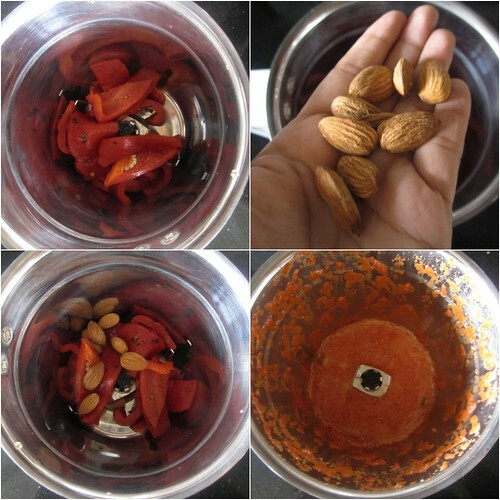 Into a mixer jar,add the chopped pepper and the almonds and grind to a smooth paste.Keep aside. Meanwhile cook the pasta in salted boiling water for about 8 minutes or until al-dente.Whole-wheat pasta is best under cooked or else it will turn into a mush while stirring-you don't want that! When the pasta is almost done(about 6 minutes)add the broccoli and cook it along with the pasta. 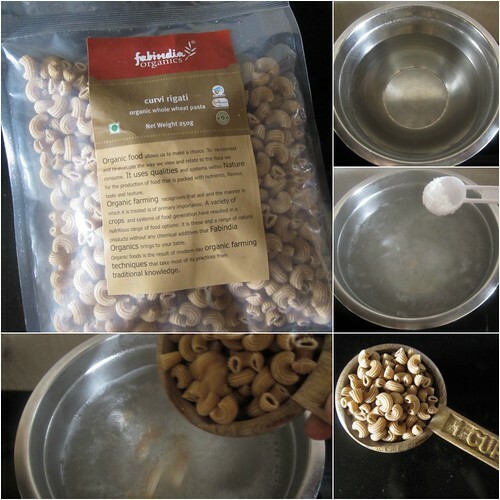 Remove a cup of the water in which the pasta was cooked and drain the pasta. In a pan add olive oil and the chopped garlic.Mix in the chopped onion and stir until it turns soft. 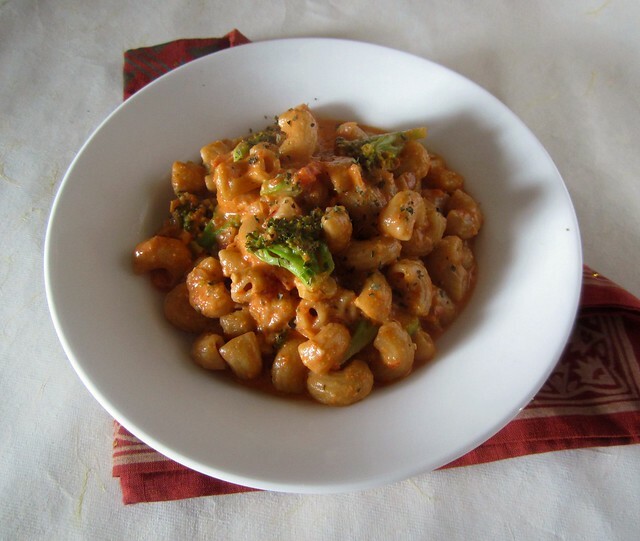 Pour in the red pepper sauce.Add salt to taste,parsley flakes and mix in the cream. 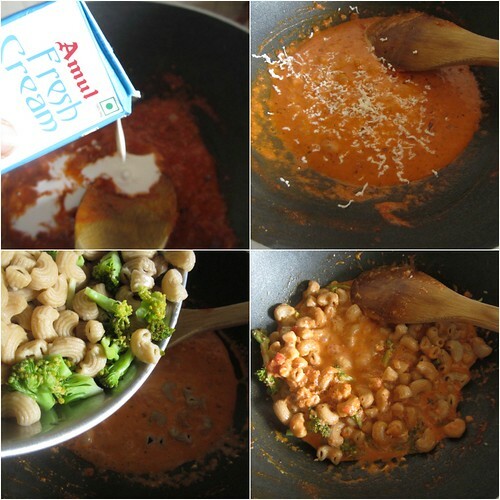 Add the cheese and the cooked pasta-broccoli and mix well.If you feel the sauce is too thick,thin it down with the reserved water in which the pasta was cooked. I love whole wheat pasta, very filling. Nice recipe, sounds really good. Delicious and yummy, nice clicks. Looks gr8 ! Beautifully presented too. Never worked with a capsicum this way.Though have read and heard many times.But this pasta recipe excites me to try this.i will soon. Wish i get that whole plate, will happily have it rite now for my lunch. nice blog.First time here and i like all ur recipes. When u r free please drop into my blog. Red bell pepper has more flavor than the green one.I've never tried with green so not sure how it might taste,sorry! It was so delicious. I also added some pasta sauce and tabasco. Thanks for the recipe. Loved it. 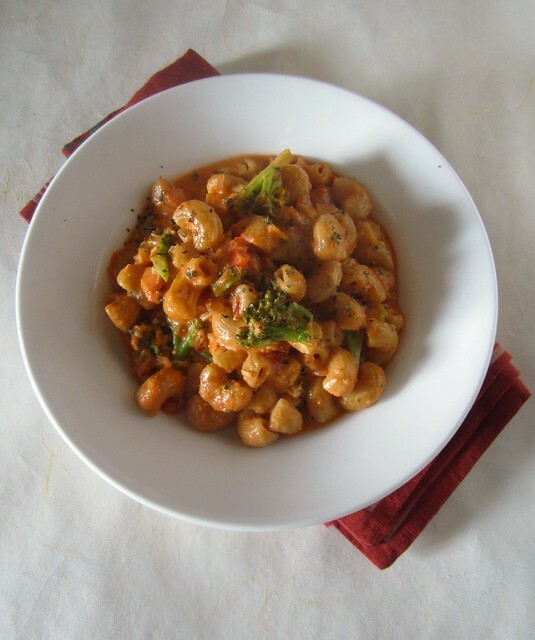 Looks super, one of my favorite pastas! 2. Can parsley flakes be substituted with something else. 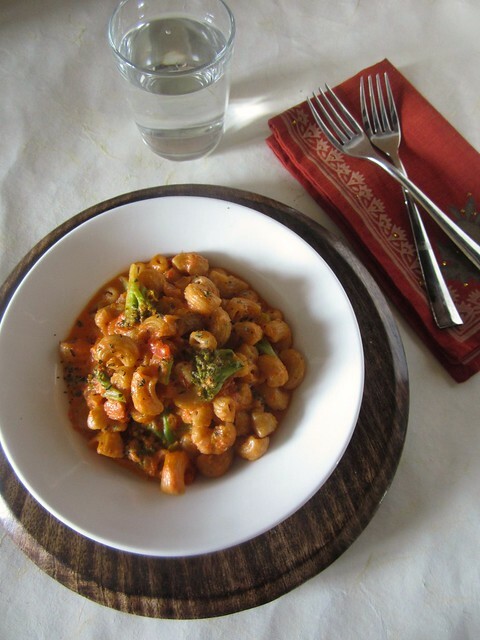 almonds help thicken the sauce as well as impart a nutty flavour.Parsley can be substituted with any other dried herbs of your choice.